It was a perfect day in Humboldt County. Out in Bridgeville, they were warming up their alien spacecraft. In Garberville, the Getti Up baristas were casting fresh good-brew spells around their espresso hut. On the Lost Coast, everyone happily resumed searching. In Fortuna, when the sun burst forth and announced he’d stick around, all the residents leaned out their kitchen windows and cheered. In Ferndale, cream poured forth from every spigot and cows in their fields did hitch kicks. Up in Arcata, coffee beans spontaneously roasted and ground themselves, McKinley cracked a smile, and travelers jeered, momentarily, then went back to petting their puppies. In McKinleyville, ocean breezes scented with farm flowers and horse dung parted bedroom curtains and fluttered in waking nostrils. In Blue Lake, the Mad River twinkled in every citizen’s eyes and a clown spun rapidly on one toe atop a peaked roof like a weathervane of good humor. Over in Fieldbrook, they minded their own business and tended fey gardens. In the Hoopa Valley, huge steelhead frolicked in the river and somebody tidied the rocks on the bank spelling Fish On. Downriver and upriver, people were rising to birdsong and kids yelling “C’mon!” In Willow Creek, all of the Bigfoot statues had wandered off in the night and residents awoke to the news with fierce glee in their hearts: He was real. Meanwhile, back in Trinidad, they were sleeping in, morning dreams musical with foghorns and buoy bells, while in Westhaven nobody was home -- they’d risen at midnight to attend to a secret mission in the east county. In Eureka, the marinas and Victorians and sea lions and such were picture-perfect. However, a small mob had assembled on the F Street Plaza to grumble. This “Best Of” ballot, what was up with that?! Why didn’t they put “best farm” on there? Or “best river spot”? Why do they want us to vote for “best big box” and “best fast food chain”? Really! Time to move, man, this place is going to Santa Rosa. But it was a tiny dark cloud on the day, really. These folks, too, submitted their ballots -- sharing their thwarted hopes and angered sensibilities in our “tell us your favorites” section at the bottom of the ballot. We’ll get to that at the end. For now, dear, dear readers of sweetly complex Humboldt County, we give you ... 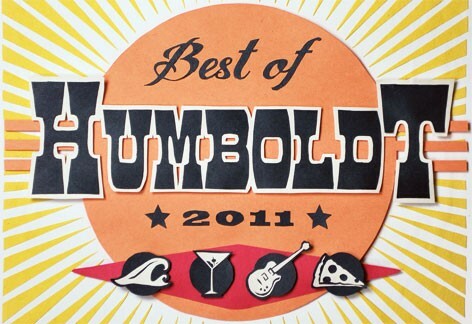 The Best Of Humboldt!